This report which was prepared by Wirsiy Emmanuel Binyuy (CAMGEW Director) and Ngum Jai Raymond (CAMGEW Project Officer) describes the project undertaken by CAMGEW. CAMGEW is grateful to Future In Our Hands (FIOH) for the financial assistance. This assistance was used to develop a tree nursery at Manchok-Oku. CAMGEW is thankful to the Ministry of Forestry and Wildlife (MINFOF) for Oku for technical assistance in forest regeneration process. The participation of community members, youths, and forest stakeholders in nursery development and tree planting was also highly appreciated. CAMGEW is a non profit organisation created in October 2007 with authorisation number N° 000998/RDA/JO6/BAPP to work locally and think globally, integrating gender issues in solving environmental and social problems in Cameroon. CAMGEW believes that the future of our mother planet-earth is in our hands (men and women, young and old) and also that the planet can be sustained by putting social and environmental justice at the centre of development using a participatory approach. CAMGEW seeks to achieve her objectives by liaising with other likeminded organisations worldwide. She has resolved to function according to core values of honesty, engagement and dedication in total respect of its constitution. CAMGEW has as vision “Changing lives of women, children and communities while protecting the environment and as mission to fight poverty; promote sound environmental management, gender balance and economic sustainable development. Emfve-mii Community forest is part of the Oku forest and Oku is found in Bui Division of the North West Region of Cameroon. The population is English speaking. Oku has the largest remaining portion of Bamenda Highland Montane Forest with a large crater lake called Lake Oku at altitude around 2500m. 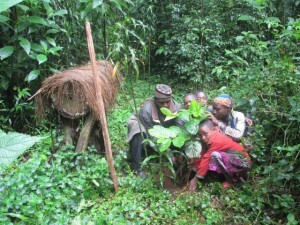 The Oku Community Forest is the first community forest in Cameroon. The forest has a unique ecosystem and is the largest remaining habitat for Bannermans turaco-a red feathered bird that is only found in the Bamenda Highland Region and is classified by IUCN Red list as endangered. Kilum Mountain with altitude 3011 meters is the second highest mountain in Cameroon, central and West Africa after Mount Cameroon. Honey from Oku Forest is white in colour and is commonly called Oku White Honey. It is cherished nationally. It is certified as a Geographical Indication Product. Oku has a rich culture. Carving is highly practiced in Oku. Oku is a tourist destination. Oku has a population estimated at about 130,000 inhabitants. It has a total surface area of about 800 km2 of which 300km2 are covered by the forest. This gives the locality a population density of about 162 persons per km2. The Kilum Mountain Forest is rich in non-timber forest products such as herbs for medicine, rodents, wood for carving, bamboo which is used locally for construction and the Oku honey with its peculiarity of being white in color. CAMGEW received a grant from FIOH in 2014 of 611,753 FCFA for nursery development and environmental education. CAMGEW supported this project by planting the nursed trees in the Emfve-mii community forest with the community and young people. The nursery was developed at Manchok –Oku. CAMGEW developed a tree nursery with 2000 trees of different varieties. The nursery was used for environmental education with community members and youths. CAMGEW had to label the trees with local names, scientific names and the use of the tree for easy learning. CAMGEW in this project helped the community members know the importance of each tree in honey production; promoting bird and other animal diversity; watershed protection; and medicinal properties and uses. The nursery was set with the participation of community members and seeds collected with them. This project had to bring together traditional authority, administrative authority, groups of forest users (bee farmers, firewood fetchers, hunters, etc) and community members to work for the conservation of their forest. Tree planting was done with different tree species to promote a bio-diverse forest with a variety of trees. Forest regeneration is an important activity with a global interest. 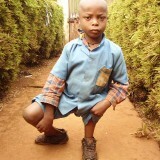 CAMGEW started this project with nursery development. The nursery fence was constructed and trees nursed. The types of trees nursed were Prunus africana, Carapas grandifolia, Pittosporum mannii, Zyzigium staudtii, Croton macrostachyst, Maesa lanceolata, Schefflera abyssinica, Bridelia speciosa, Psychotria penducularis, Solanecio mannii, Polysias fulva and Psydrax dunlapii. 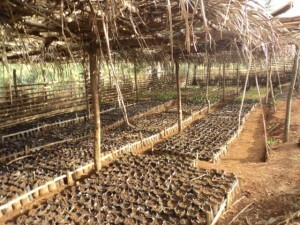 CAMGEW has more than 60,000 trees in this nursery and 2000 trees were nursed for FIOH-UK. These trees play vital role in watershed protection, promotion of biodiversity, sustaining livelihoods, promotion of apiculture and fighting climate change. The trees were shaded, weeded from too much sun and watered during the dry season. Weeding was a continuous activity to reduce weed competition for nutrients with nursed trees. Two types of nurseries were developed- bare root nursery and nursing of seeds in polythene pots. CAMGEW used the nursery for environmental education for children, youths and adults. The community learned about nursery development and importance of each tree to man and nature. CAMGEW labeled the trees with local names, scientific names and the use of the tree to man and nature for easy learning. CAMGEW carried out forest education with children inside the forest too. CAMGEW from 29th of May to 27th July 2015 carried out tree planting in the forest, tree maintenance, and field base environment lessons where children learn-by-practicing in tree planting. On the 29th May 2015 CAMGEW had a forest regeneration planning meeting with forest stakeholders. 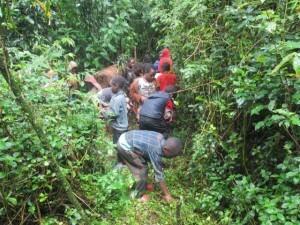 During the tree planting exercise children learned how to transport trees to the forest, dig holes and plant the trees. 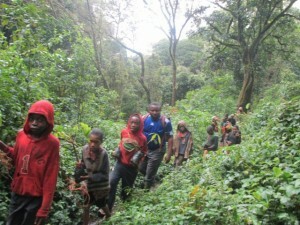 The children took part in site selection for forest regeneration. They considered areas with no trees for regeneration by planting trees of different types in one area. There were some community members with experience who joined CAMGEW to guide young people in the exercise. We were happy to have teachers of schools participate in the activity and this assured the transfer of this knowledge to classrooms by making practical learning feature in their lessons. In May 2015, community members cleared the area where trees were planted and in June 2015 they planted 1,500 trees for FIOH project as CAMGEW’s contribution in the forest regeneration process. 500 trees were planted by children. On the 14th and 16th August 2015 CAMGEW organised field based environmental education with children and youths in the forest. On 14th August 2015, 210 students with 11 teachers that gave the children holiday lessons joined CAMGEW in the nursery to learn about forest regeneration. The students and their teachers carried 300 nursed trees from the CAMGEW nursery to the forest for planting. These trees included Prunus africana, Carapas grandifolia, Pittosporum mannii, Zyzigium staudtii, Croton macrostachyst, Maesa lanceolata, Schefflera abyssinica, Bridelia speciosa, Psychotria penducularis, Solanecio mannii, Polysias fulva and Psydrax dunlapii. They learned about the importance of these trees to man and nature. They had forest education, dug holes and planted the trees. It was great joy for many as they were planting their first tree in life. Some had not been to the forest before. They called on CAMGEW to make this a regular long vacation (holiday) event. On the 16th of August 2015, 20 other children joined CAMGEW with their parents and planted 200 trees of different types. They carried trees to the forest and planted together with CAMGEW. All these young people learned about forest problems like bush fires, the presence of goats in the forest, unsustainable bee farming that cause bush fires, over trapping of rats and the cutting of fresh wood for firewood by community members. The young people were asked to propose solutions to these problems and make resolutions on a personal basis to keep the forest live. 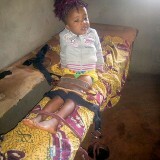 They also helped CAMGEW to collect seeds of trees from the forest to nurse in the CAMGEW nursery. These seeds went to replace the seedlings taken to plant in the forest. The clearing of the forest was part of IUCN-France project to keep trees earlier planted clean but the replacement of dead trees in World Bank Project site was done with trees from FIOH-UK. The planting of 1,500 trees was done on a voluntary basis by CAMGEW and community. Trees planted in 2013 with government funds were still maintained and dead ones replaced with government funds in 2014. 5,000 trees were planted in the Emfve-mii forest in 2015 with funds from Cameroon government, FIOH-UK, CAMGEW, IUCN-France and forest users. Wirsiy Emmanuel B. coordinated the activity. Ngum Raymond was field supervisor and community leader was Berinyuy Sebastian. CAMGEW has made monitoring of planted trees in the forest a regular activity. Monitoring of these trees is done on a daily basis by forest users like bee farmers, hunters and firewood fetchers who updated us on the state of the forest and planted trees. CAMGEW makes regular patrols and monitoring too on a weekly basis. The greatest challenge in the regeneration of the Oku forest is the presence of animals in the forest (goats). These animals kept by community members in the forest have been destroying planted trees and other seedlings that are regenerating naturally. Land close to the forest is used by community members for farming. They do slash-and-burn to prepare the farm for cultivation. 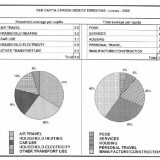 This exposes the forest to bush fires. There will be a need for continuous monitoring of the regenerated area and the whole forest. This project has ended with CAMGEW owning a solid fenced nursery that will be continuously used for forest regeneration. This nursery has a capacity of 100,000 trees. CAMGEW has nursed over 60,000 trees of different species like Prunus africana, Carapas grandifolia, Pittosporum mannii, Zyzigium staudtii, Croton macrostachyst, Maesa lanceolata, Schefflera abyssinica, Bridelia speciosa, Psychotria penducularis, Solanecio mannii, Polysias fulva and Psydrax dunlapii. CAMGEW used a participatory approach in tree planting and has seen an increase in community solidarity. Community members after participating in tree planting have understood the importance of the Oku forest and the need to protect it. Youths’ participation in tree planting increased their understanding of the forest and need to protect it. CAMGEW by involving youths in tree planting instils love for nature in youths. Through sensitization in the Community Radio, many people have changed their negative attitude towards the forest. People have removed goats from some parts in the forest. Community members, especially those who took part in the regeneration process, are now patrollers (volunteers) monitoring the trees that they planted with CAMGEW’s supervision. Forest education has been a success in the Oku Community Forest in 2015. CAMGEW succeeded in planting 2,000 trees in the forest under FIOH-UK funding. 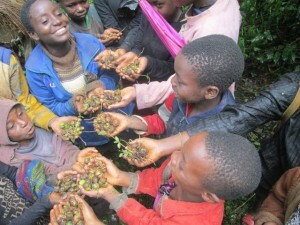 Children and youths learned-by-doing in planting trees. This activity gave CAMGEW the opportunity to carryout field-based environmental education on sustainable forest management and use. The Oku community Radio was used to reach out to the population on the need to protect the forest. C AMGEW hopes to make the tree planting event an annual activity. The Oku forest is a large forest. 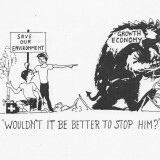 The forest is over exploited and needs to be regenerated. This Forest is important not only for its endemism but also for water catchment, food, medicine and for the livelihoods of community members living around the forest. We must protect it. CAMGEW sees the importance for field based environmental education with forest users, women, farmers, youths and children of school age to be regular activity. Environmental education with schools in and around Oku will help protect the planted trees and instil the spirit of love for nature in school children. CAMGEW recommends that tree planting should be a regular event. CAMGEW recommends that all goats found in the forest be removed to permit the growth of planted trees and the natural regeneration of the forest. Goats eat up planted and natural seedlings of Prunus and other tree species. The goats prevent the natural regeneration process of the forest. The absence of goats from the forest will permit young seedlings to grow and increase their rate of survival. CAMGEW recommends sanction to the owners of goats living in the forest. General patrols carried out and goats found in the forest caught. The tradition is encouraged to get involved in the catching of goats. There is a zone of pasture at the top of the forest where they could keep their animals. CAMGEW sees the need for a demarcation between the forest and the savannah land at the top of the forest. This will prevent the movement of animals from the top savannah land to the forest. The absence of domestic animals in the forest will promote the regeneration process.